Our vision is to present a solution to any potential customer, no matter what the circumstances. We are backed by an ambitious team with the same drive to bring you the best possible service. The quality of what we offer combined with the care we provide is what makes us the best around and we plan to continue the tradition for years to come. We combine emerging technology with reliable standards to bring the best possible service to our customers. Our business is built on a foundation of strength through satisfied customers and equally satisfied team. We are honored that nearly 90% of our business is through repeat customers or referrals. Our company was established in 1976 on the square in downtown Galesville as Jeff's Shell with the husband & wife team of Jeff and Tammy Paulus. As more satisfied customers shared their stories with others, the business continued to expand and, by 1990, we had outgrown our shop and moved to our current location just north of Galesville. We set a new standard in the area for distinctive service with a guarantee that was previously unheard of and now offer a qualified and friendly team of eleven to serve you. We Recycle! Click here to learn more about our Recycling program. Jeff's Service supports groups and events in the community. 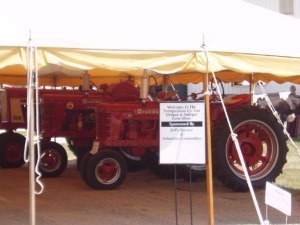 Jeff's Service Sponsors the Unique & Antique Tractor Show at the Trempealeau County Fair.